You may think I’m exaggerating, but I really think this recipe is worth a Blue Ribbon! You can’t beat a super simple Crock Pot meal, especially one that tastes amazing and the whole family enjoys. We’ve made a lot of Sloppy Joe’s in our day, but this recipe takes the burger. Incredibly juicy ground beef smothered in a savory sauce will bring even the pickiest eater to their knees. You only need 2 simple ingredients (that’s right – two!) plus your crock pot to pull off this wonderfully tasty meal. 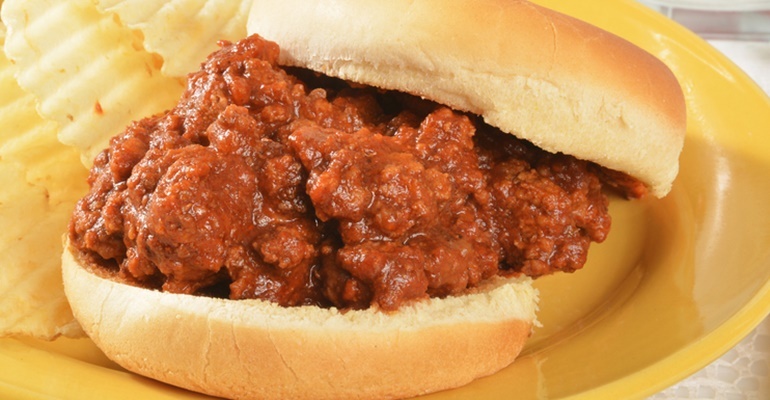 We love the term “set it and forget it” here at Recipe Roost, and that’s exactly what you’ll do when you “cook” this simple Sloppy Joe masterpiece! Whenever I know the day is going to be super crazy, I turn to my slow cooker. This recipe is one of my favorites! I set all the ingredients in the morning, go on with the madness (that some call being a mommy), and when dinnertime is among us, I just bring out the crock pot! Thank heavens for slow cookers! Quick Tip: Make a double batch and freeze the other half for later! Dinner Is No “Crock” With this Savory Slow Cooker Pork Roast!